Put frozen raspberry and ¼ cup water in a small pot, sprinkle in agar ager, and stir well. Heat it over medium low heat and simmer for 1~2 minutes. Meanwhile, put amazake and silken tofu in a blender, add meyer lemon juice and zest. Blend until smooth. With running a blender, add raspberry mixture in stream line. Continue blend until smooth. 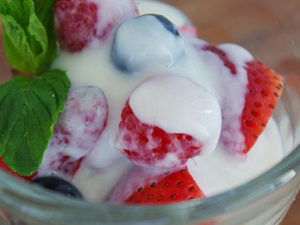 Transfer into a dessert cup, top with fresh berries and extra amazake. Chile them in a refrigerator until you serve. 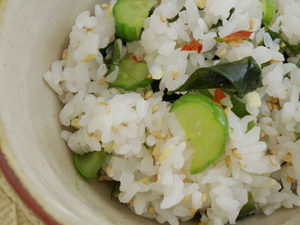 Cut a cucumber for sushi rice into half, and remove seeds, then pickle with sagohachi pickling liquid. Let it pickle in a refrigerator overnight. Rince the cucumber and squeeze excess water, and roughly chop. Cook rice with a rice-cooker. As soon as cooked, transfer to a large bowl and quickly mix sushi vinegar and sesame seeds. Divide sushi rice into half, and mix chopped sagohachi pickled cucmber to half and mix pickled ginger to another half of sushi rice. Marinate sashimi salmon with 2 teaspoon shiokoji for overnight. Simmer water in a small pan, add about 1 tablespoon sake and cook shrimps. Turn off the heat and discard cooking liquid, add ½ cup dashi and ½ teaspoon shiokoji. 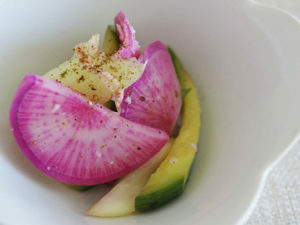 Pickle whole radish with 1 tablespoon sagohachi pickling liquid overnight, and slice them thin. Slice eggplants crosswise into ½ thickness. Sautéed them with mixture of sesame oil and nutral oil. Make a bite-size rice ball with sushi rice. Put prepared topping on a piece of plastic wrap, put a riceball, and shape temari sushi. Use cucmber sushi rice for egg, salmon and radish sushi. Use pickled ginger rice for shrimp and eggplant sushi. Put Dengaku miso and grated ginger on eggplant sushi. Decolate with peeled vegetable as you like. Prepare Shiratama. Combine Siratama flour with half amount of water, add rest of water little by little to adjust. It should be the same softness with baby’s cheek. Divide the dough into 12, and make a little ball. Cook in a simmering water, until they begin to floating on the surface. Chile the Shiratama in cold water. 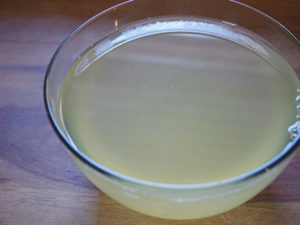 Put Kombu dashi and clam juice with sliced ginger in a pot, and gently warm them up. Turn off the heat and season with Shiokoji. Adjust the amount of Shiokoji to your taste. In a soup cup, place 2 pieces of Shiratama and pour the clam soup. Garnish with chopped mitsuba pr peashout. Cut rapini into 2/3 inch length, put in a zipper bag with ginger and Sagohachi Pickling Liquid. Massage well. Pickled in refrigerator for overnight. Gently squeeze pickled rapini to remove excess liquid. Toss with ground sesame seed before serving. You can use Chinese green such as bok-choy, gai-ran, or tatsuoi. 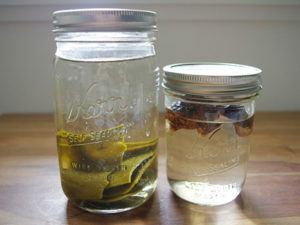 *1 tablespoon Sagohachi Pickling liquid is about 2/3 oz. Put sesame oil in a small pot, gently heat over low heat. Add White Miso and Amazake and mix well. Continue heating until Dangaku-miso is heated through. 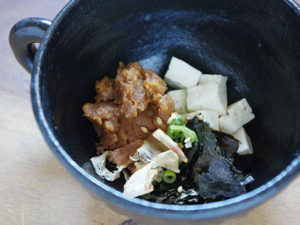 This Dengaku-Miso is going well with grilled eggplant, grilled tofu, steamed taro-roots and other grilled vegetables. Adjust the amount of amazake to your taste. Combine all ingredients to make marinade. Rinse and wipe a piece of fish or meat you want to marinade and spread the marinade on both side. Let them marinate in fridge for overnight to a couple of days. Roughly wipe off the marinade and cook them in 350F-400F oven or grill them. We love to use this marinade for salmon, black cod, pork or chicken. You can add other spices with your taste. Since miso is easy to scorch, it’s good idea to keep your eye on when you are cooking!! Wipe kombu with well squeezed cloth and soak in water. Keep in fridge for overnight. Transfer the kombu infused water to a pot (without kombu) and bring to simmer. Add bonito flake and turn off the heat. Let it steep for 5 minutes and drain the bonito flake. Do not squeeze the bonito flake to achieve clear and clean dashi. Better to choose deep black color kombu and avoid reddish,brownish one. Good quality of kombu is well dried and it has white powder on it. The white powder indicate umami flavor. 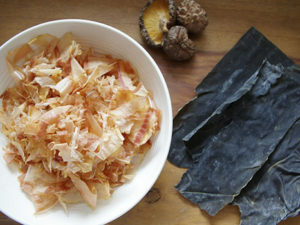 Many recipes may tell to steep kombu over low heat and remove them just before boiling point. But steeping in fridge would result in cleaner after taste, and much easier! For vegetarian skip bonito flake. You may use only kombu dashi. If you like more flavor, you may add dried mushroom to the water with kombu, or cook fresh mushroom, such as shiitake, enoki, maitake, in kombu steeped water. Warm dashi. If you want to cook vegetables or other garnish, add at this point. Put miso in a small bowl. When the garnish is heated through, turn off the heat and take 1 ladle of dashi, add to the miso bowl to dilute. Then, add back to the pot. Put garnish in a cup and pour the miso soup. Enjoy! 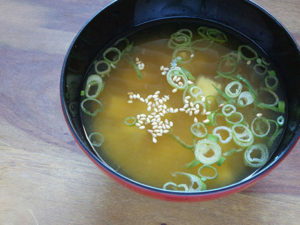 Add miso to the soup at the very end of the cooking process to maximise the flavor and benefit of miso. If you need to reheat the miso soup, heat over moderate heat and do not boil! For Tofu, wakame seaweed, and chopped green onion are standard garnish, but there are a lot of variation in Japanese home style cooking. For example, potato and onion , green cabbage, root vegetables, daikon radish, and clam. Those are cooked in dashi and then add miso. I love to add various vegetables cooked separately such as grilled asparagus, blanched snap peas or spinach, even tomato. Please try and enjoy your own cup of miso soup!! Put all ingredients other than hot water in a cup. Pour over hot water and mixing well. For vegetarian, use more nori and skip bonito flake. Adding sesame seed gives miso soup more complexity and nourishment. Rinse rice thoroughly and put in a rice cooker. Add water and soak for an hour. Cook rice and let it cool to below 140°F. Add koji and mix well. Keep the rice-koji mixture warm ( at 140°F) for 6 to 7 hours. (see tip). When the mixture become sweet, remove from the rice cooker and keep it in refrigerator. To enjoy, add equal part of water or other liquid(like black tea, almond milk, coconut milk or so). It’s easy to make amazake if you have a rice cooker with “keep warm” mode. After you mix koji to cooked rice, turn on “keep warm” mode with the lid slightly open(it is important to keep the lid SLIGHTLY OPEN!! Cause the koji culture would be die if it’s getting too hot). Stick in a chopstick or a fork between lid will allow you to keep the rice-koji mixture nice and warm. If you don’t have a rice cooker, you may cook it and keep rice warm with using a cast iron pot or a heavy-bottomed pot. Cook the rice over medium-high heat to bring it simmer with lid on, then turn the heat to low and cook it for 10 to 12 minutes. Turn off the heat and let it sit for 10 minutes. Once the rice become below 140°F, add koji and mix well. Wrapped the pot with a heavy blanket and let it ferment for 6 to 7 hours. We puree the amazake with a blender to achieve smooth texture(left one on the picture above). The sweetness ofAmazake is come from only rice. No sugar, no additive, but it’s surprisingly sweet and has earthy, floral flavor. We love to share this recipe because we would like you to enjoy freshly made amazake at your home! Combine ground sesame seed, amazake, and miso, and thin out with dashi to desired thickness. Mix with vegetables, such as cooked kale, green beans, asparagus, cauliflower, and cucumber. This sauce going well with almost any vegetables. 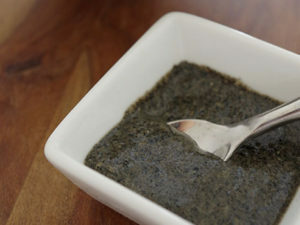 You can use either white and black sesame seed. This sauce is great with not only vegetables, but also good with steamed chicken or chilled tofu. Drain tofu and cut into 4 pieces, about 1 inch thickness. Spread Shiokoji both sides of tofu, wrap with paper towel, then place in container with plastic on top or ziplock bag and remove excess air. Refrigelate for 2 days to a week, depend on your taste. Salt in shiokoji would pull water from tofu, it is better to discard excess liquid come out from tofu. 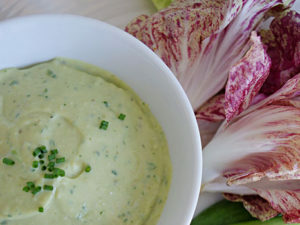 Enjoy with sauteeing, making a dipping sauce, or put on your salad. The longer you marinade, the rich flavor you will get. Shiokoji breaks down protein in tofu and speed up fermentation process, then tofu becomes almost cheese-like flavor. We use this tofu for Chicken tofu ball. Sauteed Shiokoji tofu would be nice entree for meatless Monday dinner! Cut a cucumber in half lengthwise. 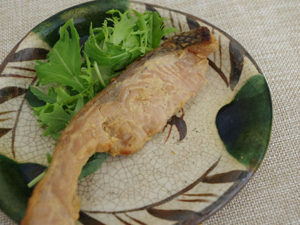 Place in zip-lock bag with 1 tablespoon Sagohachi and marinade in fridge for 1~2days. Slice cucumber and squeeze excess liquid. Meanwhile hydrate wakame seaweed with 2 teaspoon water and 1 teaspoon Siokoji, let it sit for 15 to 30 minutes. Squeeze out excess liquid. Heat sesame oil in a pan over medium high heat, and stir wakame seaweed for 30 seconds. Turn off the heat and add rest of 1 teaspoon Siokoji, ginger and sesame seed. Fold wakame and pickled cucumber into rice when it still hot, and sprinkle chili flakes. Adjust seasoning. Refreshing cucumber and sesame flavor would be nice for spring to summer. Sagohachi cucumber has much more complexity than just salted cucumber. We love this simple but flavorful rice. For kids, you can skip ginger and chili flakes. Whisk all ingredients until smooth. Heat a nonstick pan (preferably square pan for Japanese omelets) over medium heat. Lightly oil the pan, and pour 1 ladleful egg mixture into a pan and swirl to spread evenly. Roll the egg from the edge before the egg has not completely set, like making a log. Pour another ladleful egg mixture and repeat the process with the roll of egg at the end. By repeating this process, you will build a thin layer on the egg roll. Continue until you use up all the egg mixture. Remove from the pan and cool for 3-4 minutes. Cut into about ½ inch thick pieces. Tamagoyaki is a staple dish for breakfast and lunch box.This lightly sweet omelet is Japanese comfort food, taste of Mom. How it’s seasoned is different by each household, but in my memory-lane, it has been always sweet side. 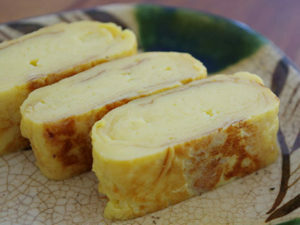 Originally Tamagoyaki is made by repeating cooking thin layers of eggs and rolled into a log. There is a special rectangular Tamagoyaki pan to make it a little easier, but you can use regular round pan as well. But, if you find it is difficult to make a roll, you may cook like making a regular omelets, or making scrambled egg. Combine amazake and coconut milk. Enjoy with your favorite fruits! Amazake has natural sweetness came from rice, because Koji turns starches in rice into natural sugar. Amazake is also probiotics and good source of vitamin Bs. 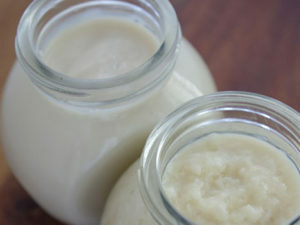 Enjoy this creamy, milky, non sugar, daily free dessert sauce without any guilt. This sauce is going well with tart fruits such as berries, stone fruits, and tropical fruits. Slice tofu into ½ inch thick. Spread miso and siokoji mixture on both sides of tofu. Marinade for a day. Puree all ingredients in blender, adjust seasoning. You may add sagohachi or amazake to balance its taste. 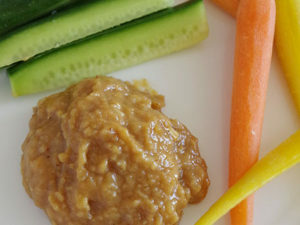 This vegan dip is great for vegetable sticks, pita chips, and also yummy as sandwich spread. You can use our White Miso, Chickpea Miso, or Kyoto Sweet Miso. Combine all ingredients except olive oil. 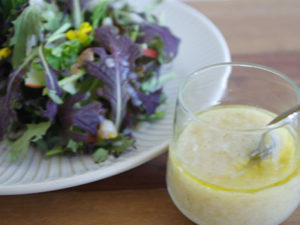 Whisk the mixture while gradually add olive oil in a stream for creamy vinaigrette. Enjoy with your salad green! By changing vinegar and oil, such as rice vinegar, sherry vinegar, red wine vinegar, sesame oil, nut oil and so on.., you can create your own flavor! Adding fresh herbs and/or spices would be nice, too. Gentry warm toasted sesame oil until fragrant. Meanwhile, coarsely grind toasted sesame seed with a spice grinder or a mortar. Combine all ingredients and mix well. Thin out with dashi or water as you like. Amazake Ginger Sesame Miso is perfect for dipping sauce for vegetable sticks, especially for cucumber. Also delicious with tofu steak, grilled chicken, pork chop, and grilled fish (salmon, cod, scallop etc.). I love to eat with steamed rice (or making grilled rice ball aka “Yakionigiri”). 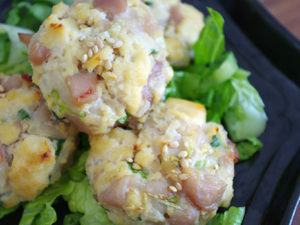 Cut chicken thigh into bite size and put in a zipper bag with 3 tablespoon Siokoji. Marinade for about 1 day. 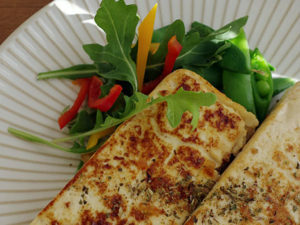 Slice tofu into ½ inch thick and spread rest of Siokoji(1 tablespoon) on. Wrap with paper towel and refrigerate for 1 day. On next day, chop roughly the marinated chicken thigh. Crush marinated tofu. Combine all ingredients and mix well. Preheat an oven for 350F. Meanwhile, make a ball with about 2 tablespoon chiken-tofu mixture. Bake the balls on oven paper lined sheet tray. Bake for about 20 minutesu. This chicken-tofu mixture can be stuffed in a portobello mushrooms or other vegetable and bake them in same temperature ovens. 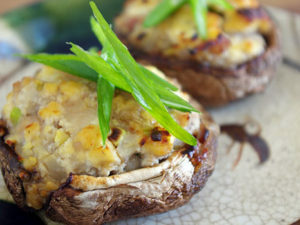 We recommend to spread 1~2 teaspoon of ginger miso on mushrooms before stuffing the mixture. 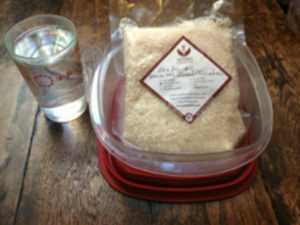 You will need one Aedan Shio-koji Kit (Koji mixed with salt), one cup of water (240 cc) and a container with lid. Mix the koji and the water and transfer to the container. Leave the container at room temperature and stir thoroughly once a day. After one week to ten days, when the koji looks fluffly and the saltiness becomes milder, then the shio-koji it’s ready. (The koji will release a nice aroma!). After it’s done, keep refrigerated. Cut the eggplants in half lengthwise and cut off the stem and calyx. Using the tip of a paring knife, cut an incision down the middle of each half, making sure not to cut through the skin, but cutting down to it. Salt the eggplant lightly and let sit for 10 minutes. Meanwhile preheat the oven to 425 degrees. Line a baking sheet with foil or parchment and brush with sesame oil. 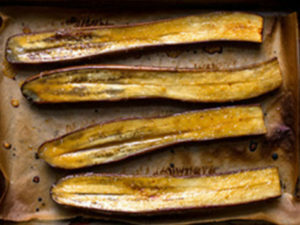 Blot the eggplants with paper towels and place, cut side down, on the baking sheets. Roast for 15 to 20 minutes, until the skin is beginning to shrivel and the flesh is soft. Remove from the oven, carefully turn the eggplants over, and preheat the broiler. To make the glaze, combine the mirin and sake in the smallest saucepan you have and bring to a boil over high heat. Boil 20 seconds, taking care not to boil off much of the liquid, then turn the heat to low and stir in the miso and the sugar. Whisk over medium-low heat without letting the mixture boil, until the sugar has dissolved. Remove from the heat and whisk in the sesame oil. Brush the eggplants with the miso glaze, using up all of the glaze. Place under the broiler, about 2 inches from the heat, and broil for about 1 minute, until the glaze begins to bubble and looks shiny. Remove from the heat. Allow to cool if desired or serve hot. To serve, cut the eggplant halves on the diagonal into 1- to 1-1/2-inch slices. Recipe from a NYTimes article by By MARTHA ROSE SHULMAN Published: September 13, 2013. Cut the vegetables you would like to make pickles with into bite size. Put the vegetables, ginger, and sagohachi Pickling liquid in a plastic bag. Put in a refrigerator and leave 2hours to overnight. We love pickle Japanese Cucumber or Persian Cucumber for summer. Also, raw asparagus and summer squash are good to pickle with our Sagohachi, too. Please let us know when you find out unique and yummy pickles with our Sagohachi Pickling liquid! Soaking a turkey overnight in a solution of shio koji, salt and water ensures moist results. When you add aromatics to the brine, the resulting roast is also infused with a subtle character all its own. Follow our instructions to prepare a perfect brined turkey for your next feast. Position a rack in the lower third of an oven and preheat to 400°F. Place the turkey on a rack in a large roasting pan. Roast for 30 minutes, then reduce the oven temperature to 325°F. Continue roasting until an instant-read thermometer inserted into the thickest part of the breast, away from the bone, registers 165°F and into the thigh registers 175°F, about 2 hours more. 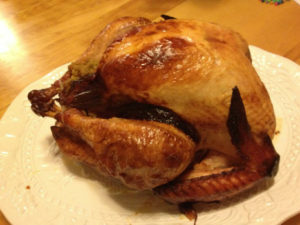 Transfer the turkey to a carving board, tent with foil and let rest for about 30 minutes before carving. Serves 12 to 14.